Republic of Ireland 3, Andorra 1 | What I think About When I Think About Writing. It has been at least twenty years since I’ve been to a soccer game. I’ve attended GAA games in Croke Park, Major League Baseball in Dallas, but not a soccer game. I’ve become lazy in this world of wall-to-wall televised sports. I’ll watch anything with a ball in it, my mother says, even cricket. 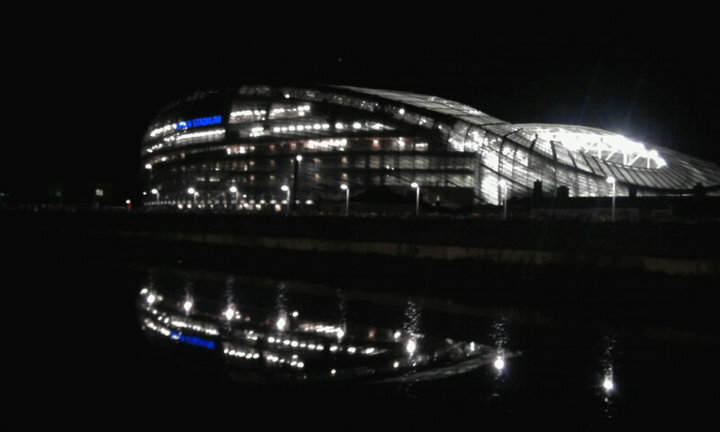 The Aviva Stadium at night. I took this photo. So it was with a huge degree of excitement and optimism that the Good Lady and I got tickets to see the Republic of Ireland team take on the minnows of Andorra in the first competitive match at the new Aviva Stadium at Lansdowne Road. And what a marvellous new stadium it is, too. Every seat is afforded a perfect view of the pitch. The open-plan roof provides cover from the elements; but the rain decided to give itself the night off – thank God. As for the game, it was very enjoyable; fast-paced, with plenty of goal mouth action. Ireland scored three goals, courtesy of Kevins Kilbane and Doyle and skipper Robbie Keane. The downside was the Andorra goal in the dying moments of the first half. But you can’t have everything. 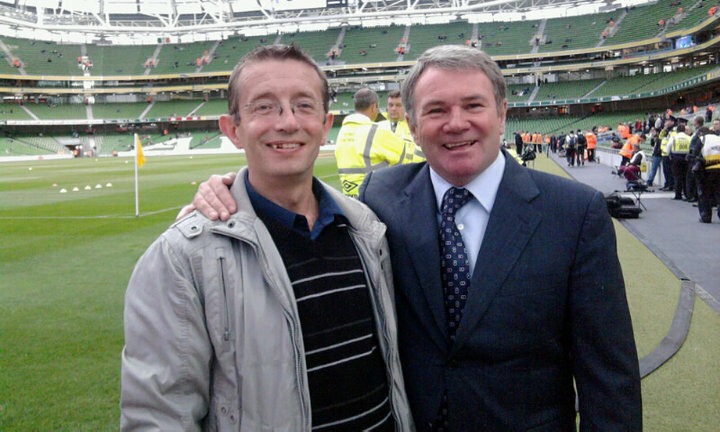 There was the added bonus of a fan photo with the legendary ex-Liverpool, Aston Villa and Republic of Ireland midfielder Ray Houghton. He put the ball in the net against England in Stuttgart in 1988 (our first ever victory over the traditional enemy) and against Italy in USA 1994. Ray happily posed for photos before heading off to his media duties. Results on the night see Ireland top Group B with Slovakia (who beat Russia, the top seeds in the group, 1-0). Armenia and Macedonia played out a 2-2 draw. Already I’m looking forward to our next home game, against the Russians on 8 October. This entry was posted in Sports and tagged Andorra, Aviva Stadium, Croke Park, Italy, Lansdowne Road, Major League Baseball, Republic of Ireland, Robbie Keane. Bookmark the permalink. Sounds like you had fun. Yay!